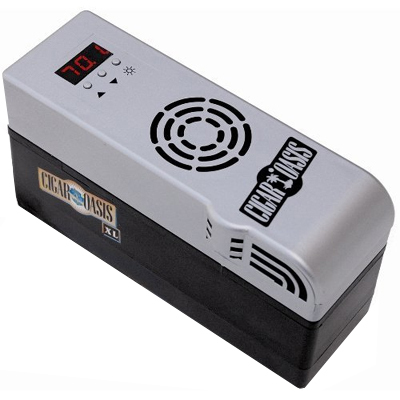 The Cigar Oasis XL automatic cigar humidifier was designed based on recommendations made by cigar aficionados to solve the cigar humidification problems experienced with passive sponge type devices. 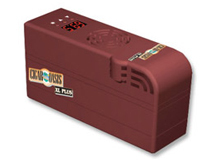 The Cigar Oasis XL is a self-contained humidifier comprised of the upper control unit, lower replaceable distilled water cartridge, and battery pack. The humidifier is ready to operate on batteries or outlet power. Cigar Oasis XL filters and circulates the air inside the humidor, eliminating "musty" odors commonly associated with well-sealed humidors. 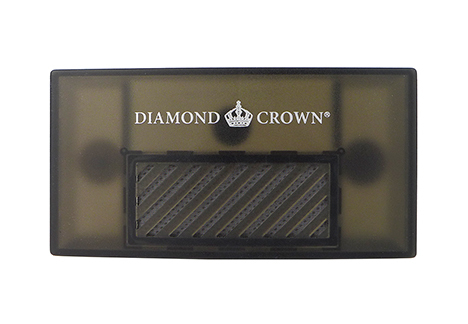 The unit recovers rapidly to the controlled humidity after the humidor has been accessed. 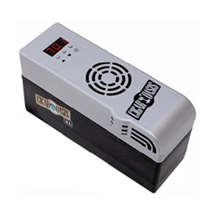 Dimensions: 3.5" high x 2" wide x 6" long with battery pack; 2.5" high x 2" wide x 6" long with AC power. 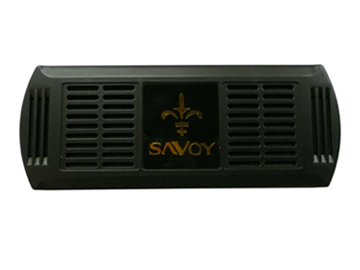 The Cigar Oasis XL Plus automatic humidifer uses the same microprocessor technology and features as the Cigar Oasis XL. 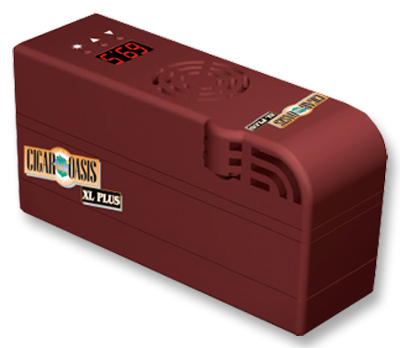 The basic difference is a change in the air flow and water cartridge which allows the Cigar Oasis XL Plus to pick up more moisture, thereby providing more rapid humidification, especially for larger personal humidors, chests, end tables, and other similar enclosures. The Cigar Oasis XL Plus uses foam in the water cartridge, eliminating wicks and the potential for water splashing. This humidifier comes standard with a large cartridge and should be used with AC power. An optional water cartridge/battery pack unit can be attached to the control unit for battery powered operation. 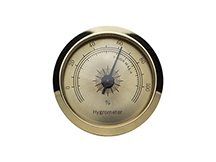 Dimensions: 3.5" high x 2" wide x 6" long with standard water cartridge. 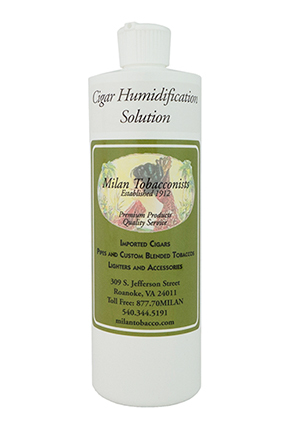 Milan's Cigar Humidification Solution contains 10% propylene glycol and 90% distilled water. Just fill your humidifier with the pre-mixed solution and humidity will be automatically regulated at 70%. 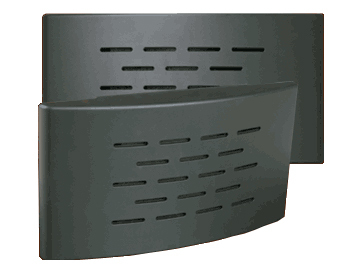 The solution increases the life expectancy of the humidification device and acts as a natural antifungal agent. This solution is not for use in humidification systems that require 100% tap or distilled water. 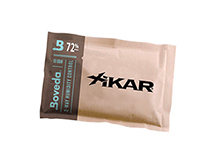 The XIKAR Boveda 320 Gram 72% humidification packet constantly responds to the changes in ambient temperature and humidity in your full-sized humidor (1 packet per 150 to 200 cigars) to eliminate all fluctuations and cycles of humidity by simply unwrapping the cellophane and placing the correct number of packets in your humidor. This preserves the natural oils, sugars, and character in cigars and allows them to improve with age. Each 320 Gram packet is the equivalent to over five 60 Gram packets and uses the same FDA-compliant saturated solution of pure water and natural salt contained within a water-vapor permeable reverse osmosis membrane. In wood humidors, the actual RH will be held at a constant level of one to four points lower than the level stated on the packet, depending on the barrier properties and/or quality of the humidor. The actual RH will be held at precisely 72% in sealed containers. Replace the maintenance free packet when firm. 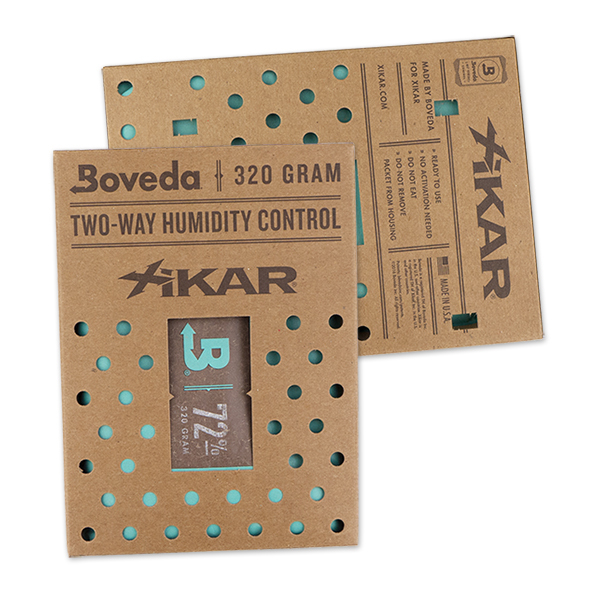 Dimensions: 6.75" H x 5" W x 0.82 D"
The only two-way humidity control of its kind for desktop humidors, the XIKAR Boveda humidification packet constantly responds to the changes in ambient temperature and humidity in your humidor to eliminate all fluctuations and cycles of humidity for a two-month period. This preserves the natural oils, sugars, and character in cigars and allows them to improve with age. 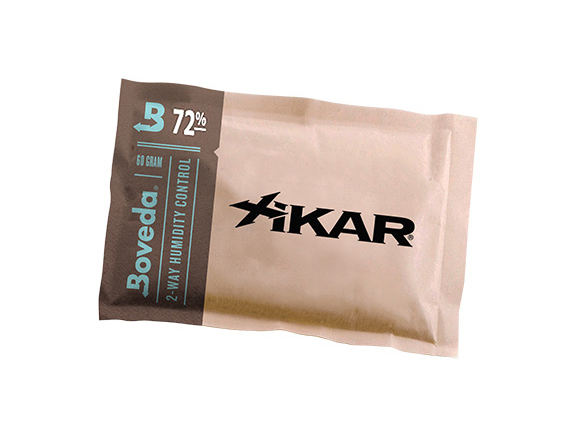 Each packet consists of a specially prepared saturated solution of pure water and natural salt contained within a water-vapor permeable reverse osmosis membrane. 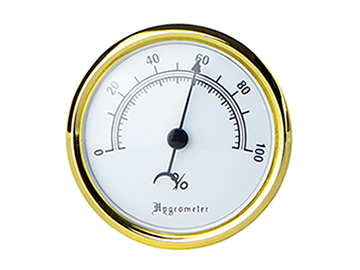 In wood humidors, the actual RH will be held at a constant level of one to four points lower than the level stated on the packet, depending on the barrier properties and/or quality of the humidor. The actual RH will be held at precisely 72% in sealed containers. 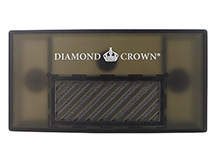 The Diamond Crown Precision Hygrometer uses state-of-the-art digital technology to ensure precise and accurate humidity and temperature readings in your humidor with the added benefit of a low profile design and long battery life (up to 4 years). The large LCD readout instantly converts the temperature reading from Fahrenheit to Celsius at a flip of the switch. Size: 3" x 2-1/4" x 1/4"
The XIKAR Slim Rectangular Digital Hygrometer/Thermometer with adjustable calibration registers temperature in Fahrenheit and Celsius. 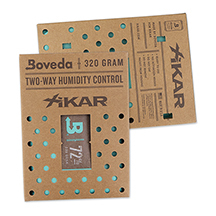 Humidity accuracy (RH) is +/- 2% at 70% humidity and temperature accuracy is +/- 1 degree C/F ensuring your cigars stay at your desired humidity. 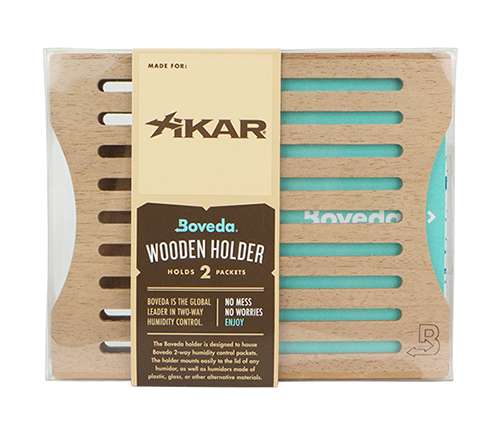 XIKAR offers a lifetime guarantee on its products. Battery is included. The round XIKAR PuroTemp Digital Hygrometer/Thermometer is designed to ensure accuracy right out of the box without having to calibrate. 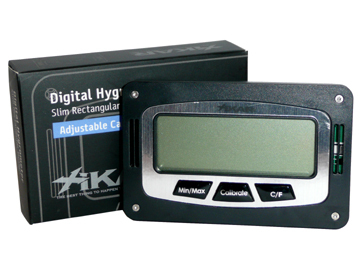 XIKAR hygrometers are manufactured to exact specifications for long term accuracy and minimal maintenance. 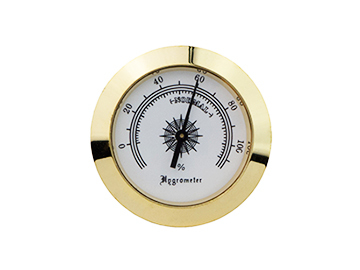 They magnetically attach and accurately display the relative humidity and temperature in your humidor. 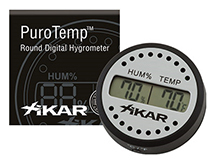 Humidity accuracy (RH) is +/- 2% at 70% humidity and temperature accuracy is +/- 1 degree C/F with a refresh rate every 10 seconds. 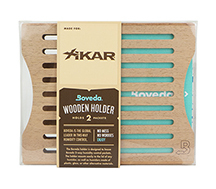 XIKAR offers a lifetime guarantee on its products.